The primary function of JATC is to provide service to the community focused on the needs of children and families. Using information from the community, JATC members assess local needs and develop service projects designed to match members’ interests and skills with identified needs. Book Swap is a program to encourage disadvantaged kids to read. Once a month JATC members pick up an old book collection and deliver a new book collection to 3 different extended stay motels. Sheila Martin (Left), Chair of the Project, is sorting books by Fiction, Non-Fiction, and Chapter Books. 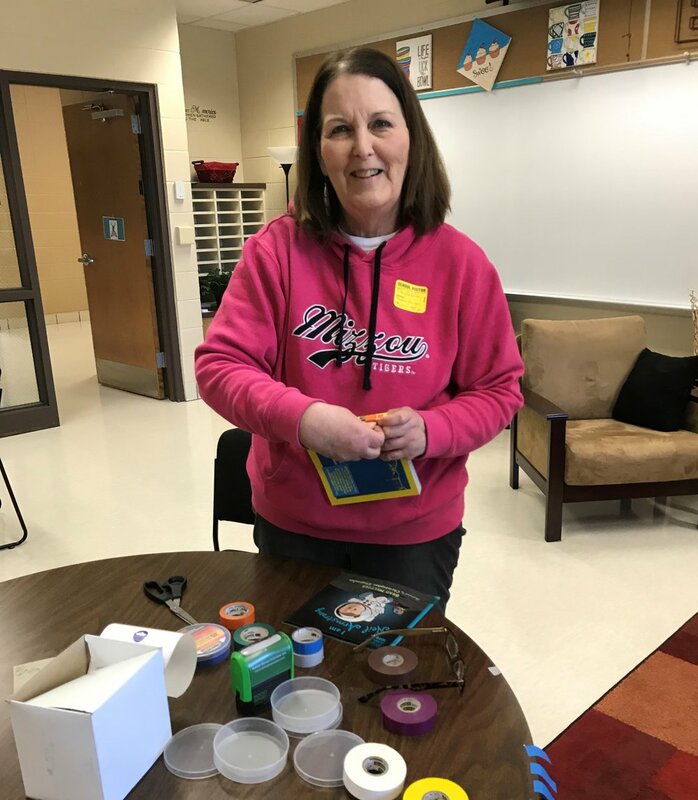 Sheryl Schiller (Right) is identifying the type of book by putting different colored tape on it and placing a “Donated by Junior Auxiliary” sticker in the book. This Spring all the Book Collections have been updated with new books ordered by the committee. JATC adopts 3 or more students through the Branson Schools Social Work Office and provides gifts to help the kids have a good Christmas. JATC members Becky Koehler, Sue Kelly, and Sheryl Schiller filled their baskets with lots of goodies for the kids! JATC provides a Halloween craft table where we do Halloween themed crafts with kids at the Grape Stomp Festival in Hollister, MO. JATC member Sharla Mooney is decorating spiders and pumpkins with the kids. Hug Baskets--This project provides a basket of necessary items to a needy applicant in the community. This applicant can be anyone who needs extra care. Occasionally, the Chapter will also do a group collection for needed items. JATC member Tami Bandy adjusts the laces of this dress for Tieryn Preston. Prom Dress --This project provides new or gently worn prom dresses and accessories to high school girls who might not otherwise have an opportunity to enjoy their proms. Girls are identified through high school counselors and are presented dresses to choose from with the help of JATC members. ScholarCare --This project is designed to provide support and encouragement to a student who may be experiencing his/her first time away from home. Selection of a student is based on the applicants' essays demonstrating their need for continuing support from JATC. In addition to a $750 scholarship, renewable annually based on satisfactory college achievement, JATC members send notes, small gifts, and emails throughout the school year. We currently have three (3) ScholarCare recipients: Shana Topka, Branson, Year 4 with us; and Kaitlyn Johnson, Hollister, Year 2 with us, and Sophia Meltke, Bradleyville, Year 1 with us. We are proud to announce that Ashley Shockey, Branson, just finished her 4th year with us and graduated from Truman State in Kirksville, MO, with a Bachelor of Science in Biology. Click here to get our 2019-2020 ScholarCare application. Bella Kiracofe looks in awe at Santa during the 2018 Santa’s Gift House. JATC would like to extend a special thank you to the following for their extra help with our Santa’s Gift House project: Branson United Methodist Church, Tanger Shopping Mall, Lowe’s, Liberty Exposition Services, Inc., L&J Plumbing, and AJ Elite Nails and Spa. This project provides a $750 scholarship to a graduating senior at each of the four county high schools (Branson, Bradleyville, Forsyth, and Hollister), awarded on the basis of demonstrated initiative and commitment to community volunteer activities. Congratulations to the recipients of our 2018-2019 scholarships: Kourtney Shipley, Bradleyville; Tawny Denzer, Branson; , Collin Gwin, Forsyth; Madison Hatfield, Hollister. Click here to get our 2019-2020 Scholarship application. JATC members Mary Jo Green and Madeline Allin deliver supplies to Kirbyville principal Addie Gaines and a group of Kirbyville students. School Supplies --This project provides supplemental school supplies to elementary schools in January or February for distribution to students on an as-needed basis. This year supplies were delivered to Bradleyville, Kirbyville, Mark Twain, and Taneyville. Teachers at these schools also received $40 gift cards to purchase supplies for their individual classrooms. The Tender Critters Project provides new stuffed animals for children who are brought to the emergency room and/or admitted to Cox Hospital in Branson. At times this project will provide stuffed animals to Police, Sheriff, Fire, Emergency Responders, and/or any other organization in Taney County that needs to provide comfort for kids in a stressful situation. February is our "Tender Critters" drive month. In 2019, Binswanger Glass, Central Bank, Branson Bank, CoxHealth Fitness Center, St. Joseph's Anglican Church, Branson United Methodist Church, Kimberling City Church of Christ, Victory Chiropractic, and Legends in Concert Theatre are acting as drop off points to collect animals. Vietnam Veterans of America (Chapters 913 and 1119), Taneycomo Chapter National Daughters of the American Revolution, and PEO, Chapter IB also donated critters. This year the community provided almost 600 animals for our project during this February drive. Crisis Center of Taney County Support --This project provides birthday parties for children who are living at the Women's Crisis Center of Taney County, an organization that provides care to women and children who are experiencing domestic violence/abuse. In addition, weekly “Empowering the Little Dreamers”, a two hour program gives the kids a chance to have a good time with special activities while moms attend counseling. We are in the process of collecting funds to build a playground for these children. JA member Cathy Brown enjoys tea with one of the “Little Dreamers”. Do you like what we do? Please visit www.GreatNonProfits.org and leave us a review.